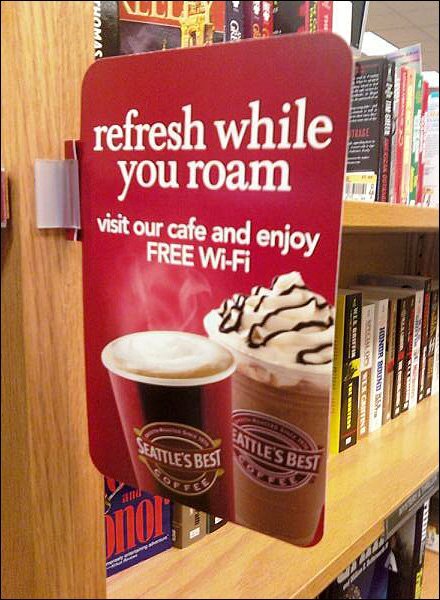 Is WiFi a Benefit To Retail? Some businesses want their customers to linger. Some like Diners prefer customers to eat and leave because turnover is what increases sales. 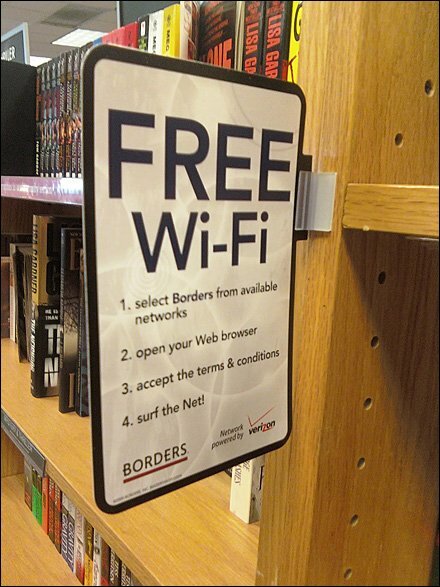 WiFi and and an invitation for an expresso would help extend the visit, foster browsing, and add to purchases in a bookstore environment. Alternate signs help the invitation look different and catch the eye. But just maybe the retailer had outside backing. One sign cross promotes Seattle’s Best and the other contains a Verizon signature. Maybe these venders provided sign support? You should ask some of your suppliers for helpful cross-sell support. CLICK the thumbnail the a second sign concept. What would both extend your customers visit AND increase purchases? Or is turnover the better strategy? For more high-tech at the shelf edge SEE….